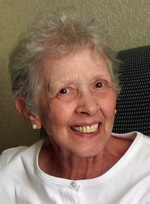 Donna Quinn Joyce passed away on June 14, 2017 at the age 86 in Ketchum, Idaho. She was born on October 25, 1930 in Pittsburgh, PA to Robert S. and Lucile Quinn (nee Fisher). Donna graduated from Langley High School in Sheraden, PA and attended secretarial school following graduation. Donna worked for several businesses in Pennsylvania, California, and Florida and was the third generation of her family to work for the Pennsylvania Railroad. She moved to Florida in 1967 and spent the majority of her career as an Administrative Secretary with the Florida Marine Patrol in St. Petersburg and Tampa, FL. She retired in 1992 after 21 years of service. After living in Florida for over 30 years, Donna moved to Milwaukee, WI in 1998 to be near her daughter Susan and her family. She lived in Milwaukee for 15 years before moving with Susan, son-in-law Steve, and granddaughter Shannon to the Wood River Valley in 2013. Donna loved the ocean, spending time with her family, playing the piano, watching old movies, and providing a lap to sleep on for the family cats. Donna is survived by her daughter Susan Robertson and granddaughter Shannon Robertson of Hailey, ID, niece Meredith Dimperio and nephews Christopher Quinn (Betsy) and Patrick Quinn of San Diego, nephew Robert S. Quinn III of Tampa, FL, and niece Kerry McElfresh (Greg) of Ferndale, WA. Further survived by other relatives and friends. She was preceded in death by her parents, brother Robert S. Quinn, Jr. (Mary), niece Kathleen Quinn, and son-in-law Steven Robertson. A memorial service will be held on Saturday, July 8th at the Fox Point Lutheran Church in Fox Point, WI. Interment in the Wisconsin Memorial Park in Brookfield, WI will occur at a later date. In lieu of flowers, please consider a memorial donation to the charity of your choice or the Wounded Warrior Project. To send flowers to the family of Donna Joyce, please visit our Heartfelt Sympathies Store.